Our cutting-edge charter equipment is widely regarded as ‘best in class’ by our global customer base. Tailored specifically for each client’s individual needs, with a focus on safety, comfort and animal welfare, our bespoke in-flight equipment is truly one-of-a-kind. We work closely with partner agencies to ensure our own equipment is the best in class – as well as designing bespoke one-off penning solutions for the safe transportation of animals of all shapes and sizes. Through continued design innovation, our growing range of stalls and penning provides greater flexibility with movable partitions, drop-top and collapsible-top designs and added safety and comfort features for all their occupants. 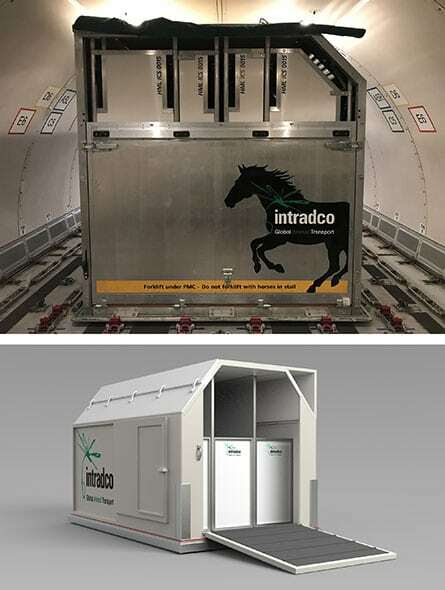 Intradco Global assists clients with sourcing and manufacturing bespoke wooden livestock crates for all aircraft configurations – including single, double and three-tier stackable options. We handle all live animal shipments with care and in full compliance with IATA's Live Animals Regulations. Whether you’re looking to move sheep, goats, alpacas or camels – we can provide a custom crate design to match your requirements. Intradco Global’s cattle stall equipment is strong, robust and quick to assemble and dismantle. The cattle stalls can contain up to five cows during flight and feature a removable panel door for easy loading and unloading. The stalls feature optimised ventilation to ensure a safe animal-friendly method for transporting cattle to destinations worldwide. Non-slip floors and interiors without rough edges are all standard features. All of the cattle stalls can be dismantled and placed flat against each other for cost-effective return shipping. 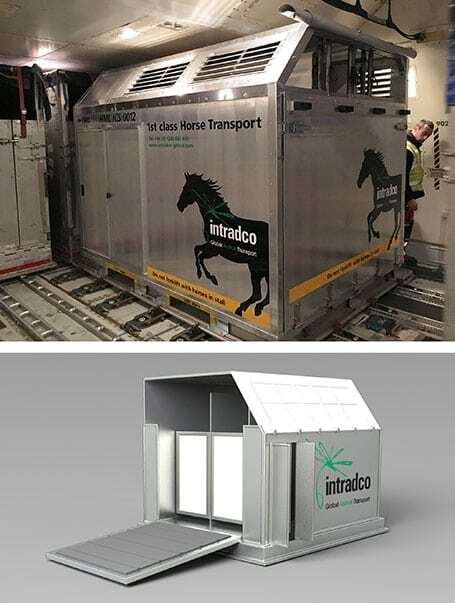 Intradco Global's bespoke giraffe crates are a great example of our ability to custom-build stalls to the exact requirements of the animal in transport. The crates are robust and provide a safe, secure and hygienic environment for the animals to travel in. Each crate features small viewing gaps and a keeper platform for access to the Giraffe throughout transportation, a window for their larger than life occupants to provide ventilation and visibility, and a tie down canopy. The crates can be easily manoeuvred for loading and unloading with forklift liftings and crane load-bearing points. Intradco Global equipment is compatible with Boeing 747 or 777 freighters, McDonnell Douglas MD-11s, Airbus types and other wide-bodied cargo aircraft, making it a favourite with many of the world’s leading airlines. If you would like to find out more about Intradco Global’s in-flight equipment range of air stalls and penning systems, available for long-term lease or rental, please contact us today.